LAGARTO, under CDR F. D. Latta, departed Subic Bay, P. I., on 12 April 1945, for her second patrol in the South China Sea. 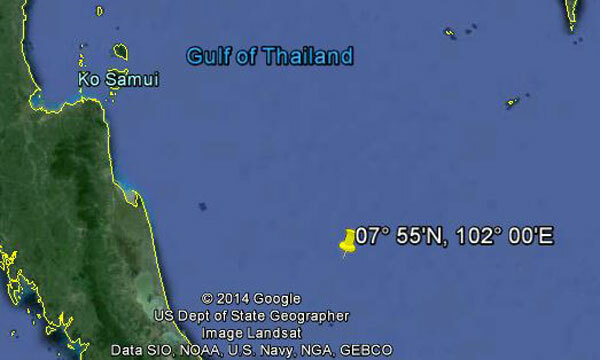 On 27 April, she was directed to the outer part of Siam Gulf. LAGARTO contacted BAYA, already patrolling in Siam Gulf on 2 May 1945, and exchanged calls with her by SJ radar. Later that day BAYA sent LAGARTO a contact report on a convoy she had contacted consisting of one tanker, one auxiliary and two destroyers. LAGARTO soon reported being in contact with the convoy, and began coming in for an attack with BAYA. However the enemy escorts were equipped with 10 cm radar, and detected BAYA and drove her off with gunfire, whereupon the two submarines decided to wait and plan a subsequent attack. Early on the morning of 3 May 1945, LAGARTO and BAYA made a rendezvous at about 7° 55'N, 102° 18'E and discussed plans. LAGARTO was to dive on the convoy's track to make a contact at 1400, while BAYA was to be ten to fifteen miles further along the track. During the day, numerous contact reports were exchanged. At 0010 on 4 May after a prolonged but unsuccessful attack, BAYA was finally driven off by the alert escorts, and no further contact of any kind was ever made with LAGARTO. Japanese information now available records an attack on a U. S. submarine made by the minelayer HATSUTAKA, believed to be one of the two radar-equipped escorts of the convoy attacked. The attack was made at 7° 55'N, 102° 00'E in about 30 fathoms of water, and in view of the information presented above, the attack here described must be presumed to be the one which sank LAGARTO. This vessel's first patrol was in the Nansei Shoto chain as part of an anti-picket boat sweep made by submarines to aid Admiral Halsey's Task Force 38 in getting carrier planes to Japan undetected. She sank the Japanese submarine RO-49 on 24 February 1945 [Editor's note: Lagarto's patrol report leaves little doubt that she sank a submarine on that date. However, the identity of her victim has not been satisfactorily resolved. Some believe it was I-371, although Commander Latta identified his target as an RO-class boat. ], and participated in several surface gun attacks with HADDOCK and SENNET. Two small vessels were sunk and two more damaged in these attacks, and LAGARTO shared credit for the results with these submarines. Commander Latta had previously made seven patrols as Commanding Officer of NARWHAL. Every patrol made by this officer was designated successful for the award of combat insignia, a record surpassed by no commanding officer in the Submarine Force. 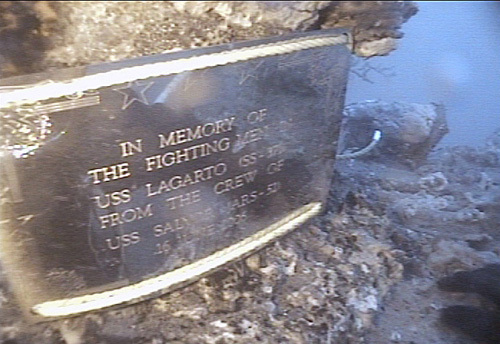 Please note -- the wreck of USS Lagarto (SS-371) was found in the Gulf of Thailand on May 18, 2005 by Jamie Macleod and Stewart Oehl of the MV Trident dive boat. 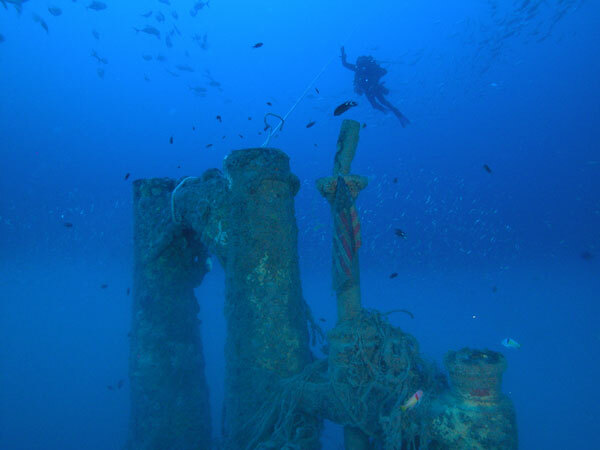 The wreck lies in 230 feet of water. 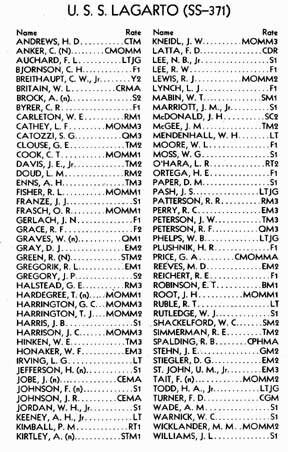 See also Ed Howard's Final Patrol page on USS Lagarto (external link).